These angel stencil designs and stenciling ideas are great for the holidays or year round. 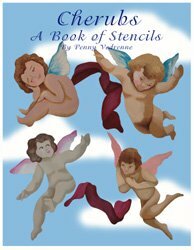 First we have a couple of free stencils and then (scroll down) I designed a couple of books of Angels and Cupids. The books can be downloaded at your computer now or you can get one in print. These designs are more detailed than the ones here. 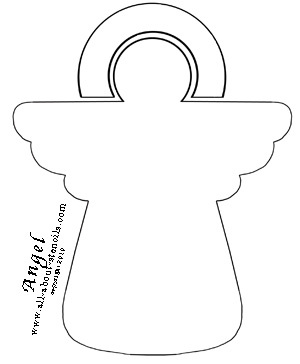 I used this angel stencil to create holiday place cards for the table at Christmas. See how at Christmas Art Projects. Below are two of the projects where these stencils were used. 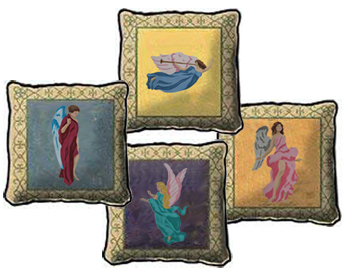 The elegant angel stencils were painted onto these pillows. If you know how to do needlepoint they can be used that way too. Do you know that stencils can be used for so much more than just dabbing paint through the openings? Well, I would like to show you how I made a Place holder that you can use for your Holiday seating arrangement. Get the details at Christmas Art Projects. This jewelry box was just a plain wooden box that I found at a flea market for a couple of dollars. 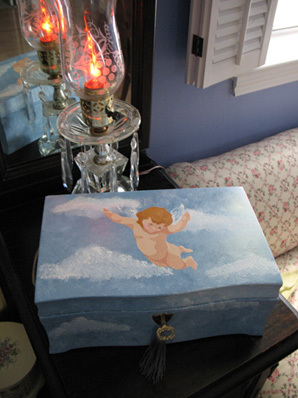 I painted it sky blue and a few wisps of white for clouds set the background for the little cherub stencil. By the way, these are part of our Free Stencils Collection. We have so many to offer that they are scattered throughout this web site so keep browsing the pages and come back here for all your Stenciling Ideas . Just right click on the free stencil and select print or save if you're on a PC or drag it into a document if you're on a MAC. Also, I like to cover the paper with a protective coating like clear shelf liner before I cut out the openings. This way I can use the stencil again and again. 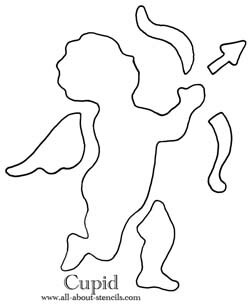 This cupid stencil (from our free Valentine Stencils Collection) will make great cards for Valentines Day, Anniversaries or any other special occasion. For more ideas on using stencils to make cards go to Card Making. Below are the two books of the above featured projects. Each book will come to you as a downloadable pdf file in your e-mail. Just check your e-mail after purchase for the link to connect to your file and print or save. It's that easy! Return to Home Page from Angel Stencil. Return to Christmas Crafts from Angel Stencil.